Overall 2011 select NRL Strike is a winner for me. Even though Select have not gone out on a limb with any major new innovations or created any major new card sets the quality in this set is a great improvement. The inclusion on the 2009 Insert sets that were missed last year because of no series 2 release makes for a wide range of cards to hit. The only minor let down is the design of the strike logo which does not add any design value to the cards at all. I think in not producing a parallel set for this release Select does step away from the pattern of collections and some will see this as a good thing and others will be disappointed. I personally think this is a breathe of fresh air and do not miss the parallel at all. 4 Card promo set given away to Select members and retailers on purchase of wholesale product. The common cards are a vast improvement on some recent designs. The cross mark representing the strike brand gives the collection a great brand identity. The eleven player cards for each team feature the players emerging from this cross design. The backs of the cards are also striking in the reverse pattern with the cross shape in the color of the team. The quality of the commons is also an improvement on some other recent release. The cards have a reasonable stock thickness and a nice glossy finish. Very few damaged cards or misprints have come out of packets and all cards seem to be cut neatly on the edges. With the 11 player cards the team logo card makes up the twelve card team set. One team logo card for each team on the same cross design as the player cards. 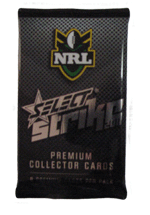 16 logo cards in all one for each NRL team. The design on this card set is a success. The combination of the head shot and the action shot give a good depth to the deign. The striking use of the team colours also provides a nice finish. The only criticism of this card is that it looks too much like the Team of the Year card with the gold embossed writing. This card for me is the stand out design of the more common inserts in this set. The change of text for the title and the clear crisp design makes for a nice card set. This set falls more inline with the strike branding in this release. They have kept the series seperate also by the silver emboss on the 2010 sets and the gold on the 2009. This card is a little too similar in design to the Club Player insert and lacks a little in inspiration. The design is neat and serves it's purpose but does not inspire you to collect them. At one in 18 packs I think the one in 8 pack club player has it's measure. This card whilst a slight improvement on the 2009 version still fails to deliver. I think Select have missed an opportunity here to deliver a one in 18 packs insert with some punch but instead have delivered a dated design that does not inspire. Always a favourite amongst collectors and sellers a like this set delivers. The cards have a nice foil finish with a striking design. The opportunity for collectors to purchase all 16 cards to redeem is too much to resist or search for your favourite to win the premiership and wait until the first weekend in October to realise your success. Overall this set is a winner the only draw back being some cards have come out of packets with a crease mark on the front. I think this insert set is a great inclusion in this years release. Having a one per box limited edition insert other than the signatures adds interest to the release. The design is clean and stylish and the quality good. The backs of the cards are a nice contrast to the white and silver of the card front. These are a similar design to the 2009 with a strike of colour on the front of the card. This makes them easy to pick apart from the 2009 version. As with the 2009 version this is a great inclusion are sure to be hot property with a great selection of Award Winning players. This 16 card set hit one per box is the staple attraction for Series 2 collectors and is what sets this release apart from the cheaper series 1 release. The cards are a nice design and in general the signatures are neat and crisp. The selction of players may not necessarily set the world on fire but a few stand out players are included. It's always the challenge to predict who will turn into the superstars of the game. For me keep a watch on Kieran Foran & Nathan Gardner. The case cards are as per all previous Select release and follow on from the series 1 release. 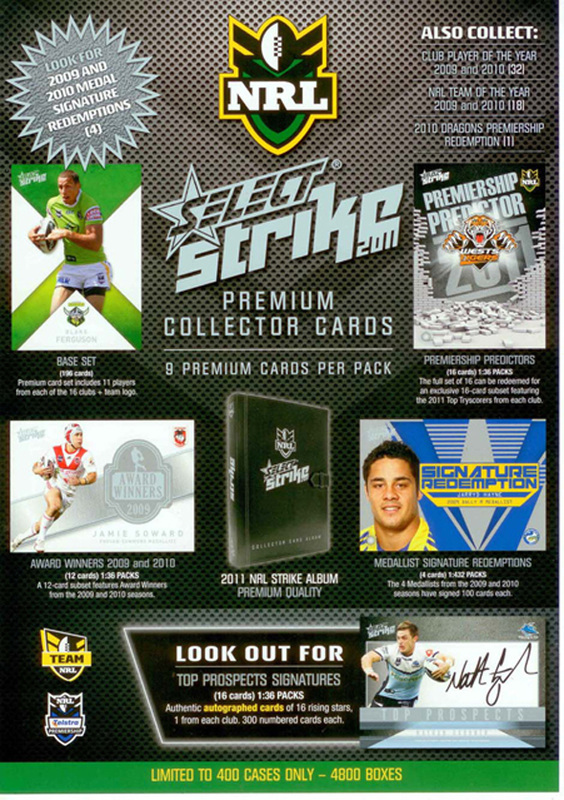 This set includes the 200 game cards for Braith Anasta and Luke Burt. The only disappointment with this release is Select have not gone the extra yard and made a signature version of these case cards and randomly inserted into cases. The Premiership Redemption inclusion comes about because of the failure to deliver a 2010 series 2 release. Inserted at one per case with 400 produced can be redeemed for the StGeorge Illawarra Premiership redemption set. This card needs to be thought of as pulling the winning predictor from last years release. Nice looking redemption card and will be highly sort after. At one per case and limited to 100 of each these medallist signature cards will be highly sort after. A great selection of four Award winning players make up this set. The striking look of the redemption cards give them a wow factor when pulling them out of a packet. We will have to wait and see how the signature card once redeemed looks but overall this is a success in design.